View of the Space Shuttle Atlantis docked to Russia's Mir Space Station, was photographed by the Mir-19 crew on July 4, 1995. A spacecraft is a craft or machine designed for spaceflight. Although it is, by definition, designed to travel into space, it may or may not be intended to return to the Earth. 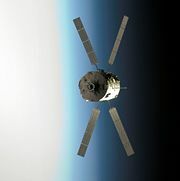 Spacecraft are used for a variety of purposes, including communications, earth observation, meteorology, navigation, planetary exploration and space tourism. Spacecraft used for human spaceflights carry people on board as crew or passengers. Spacecraft used for robotic space missions operate either autonomously or telerobotically. Robotic spacecraft that leave the vicinity of the planetary body are called space probes. Robotic spacecraft that remain in orbit around the planetary body are artificial satellites. Starships, conceived for interstellar travel, are still in the realm of theoretical ideas. Spacecraft and extremes of space travel are common themes in works of science fiction. 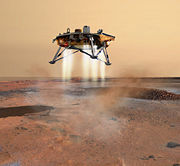 Artist's conception of the Phoenix spacecraft as it lands on Mars. A spacecraft includes a variety of subsystems, dependent upon mission profile. These subsystems may include: attitude determination and control (variously called ADAC, ADC or ACS); guidance, navigation and control (GNC or GN&C); communications (COMS); command and data handling (CDH or C&DH); power (EPS); thermal control (TCS); propulsion; structures; and payload. Spacecraft intended for human spaceflight must also include a life support system for the crew. This can include many different types of Oxygen Systems, such as the one seen in the movie Apollo 13 (1995) that exploded and almost cost the crew their lives. Spacecraft need an attitude control subsystem to be correctly oriented in space and respond to external torques and forces properly. The attitude control subsystem consists of sensors and actuators, together with controlling algorithms. The attitude control subsystem permits proper pointing for the science objective, Sun-pointing for power to the solar arrays and Earth-pointing for communications. (Guidance Navagation and Controls) Guidance refers to the calculation of the commands (usually done by the CDH subsystem) (Command & Data Handling) needed to steer the spacecraft where it is desired to be. Navigation means determining a spacecraft's orbital elements or position. Control means adjusting the path of the spacecraft to meet mission requirements. On some missions, GNC and Attitude Control are combined into one subsystem of the spacecraft. The CDH subsystem receives commands from the communications subsystem, performs validation and decoding of the commands, and distributes the commands to the appropriate spacecraft subsystems and components. The CDH also receives housekeeping data and science data from the other spacecraft subsystems and components, and packages the data for storage on a solid state recorder or transmission to the ground via the communications subsystem. Other functions of the CDH include maintaining the spacecraft clock and state-of-health monitoring. Spacecraft need an electrical power generation and distribution subsystem for powering the various spacecraft subsystems. For spacecraft near the Sun, solar panels are frequently used to generate electrical power. Spacecraft designed to operate in more distant locations, for example Jupiter, might employ a Radioisotope Thermoelectric Generator (RTG) to generate electrical power. Electrical power is sent through power conditioning equipment before it passes through a power distribution unit over an electrical bus to other spacecraft components. Batteries are typically connected to the bus via a battery charge regulator, and the batteries are used to provide electrical power during periods when primary power is not available, for example when a Low Earth Orbit (LEO) spacecraft is eclipsed by the Earth. Spacecraft must be engineered to withstand transit through the Earth's atmosphere and the space environment. They must operate in a vacuum with temperatures potentially ranging across hundreds of degrees Celsius as well as (if subject to reentry) in the presence of plasmas. Material requirements are such that either high melting temperature, low density materials such as Be and C-C or (possibly due to the lower thickness requirements despite its high density) W or ablative C-C composites are used. Depending on mission profile, spacecraft may also need to operate on the surface of another planetary body. The thermal control subsystem can be passive, dependent on the selection of materials with specific radiative properties. Active thermal control makes use of electrical heaters and certain actuators such as louvers to control temperature ranges of equipments within specific ranges. 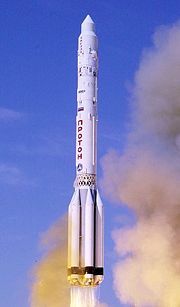 A launch vehicle, like this Proton rocket, is typically used to bring a spacecraft to orbit. Spacecraft may or may not have a propulsion subsystem, depending upon whether or not the mission profile calls for propulsion. The Swift spacecraft is an example of a spacecraft that does not have a propulsion subsystem. 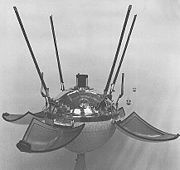 Typically though, LEO spacecraft (for example Terra (EOS AM-1) include a propulsion subsystem for altitude adjustments (called drag make-up maneuvers) and inclination adjustment maneuvers. A propulsion system is also needed for spacecraft that perform momentum management maneuvers. Components of a conventional propulsion subsystem include fuel, tankage, valves, pipes, and thrusters. The TCS interfaces with the propulsion subsystem by monitoring the temperature of those components, and by preheating tanks and thrusters in preparation for a spacecraft maneuver. Spacecraft must be engineered to withstand launch loads imparted by the launch vehicle, and must have a point of attachment for all the other subsystems. Depending upon mission profile, the structural subsystem might need to withstand loads imparted by entry into the atmosphere of another planetary body, and landing on the surface of another planetary body. The payload is dependent upon the mission of the spacecraft, and is typically regarded as the part of the spacecraft "that pays the bills." Typical payloads could include scientific instruments (cameras, telescopes, or particle detectors, for example), cargo, or a human crew. The launch vehicle is used to propel the spacecraft from the Earth's surface, through the atmosphere, and into an orbit, the exact orbit being dependent upon mission configuration. The launch vehicle may be expendable or reusable. The Space Shuttle Columbia seconds after engine ignition. The first reusable spacecraft, the X-15, was air-launched on a suborbital trajectory on July 19, 1963. The first partially reusable orbital spacecraft, the Space Shuttle, was launched by the USA on the 20th anniversary of Yuri Gagarin's flight, on April 12, 1981. During the Shuttle era, six orbiters were built, all of which have flown in the atmosphere and five of which have flown in space. The Enterprise was used only for approach and landing tests, launching from the back of a Boeing 747 and gliding to deadstick landings at Edwards AFB, California. The first Space Shuttle to fly into space was the Columbia, followed by the Challenger, Discovery, Atlantis, and Endeavour. 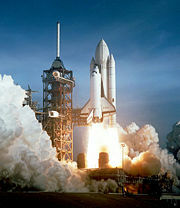 The Endeavour was built to replace the Challenger when it was lost in January 1986. 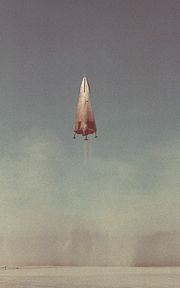 The Columbia broke up during reentry in February 2003. The first automatic partially reusable spacecraft was the Buran (Snowstorm), launched by the USSR on November 15, 1988, although it made only one flight. This spaceplane was designed for a crew and strongly resembled the U.S. Space Shuttle, although its drop-off boosters used liquid propellants and its main engines were located at the base of what would be the external tank in the American Shuttle. 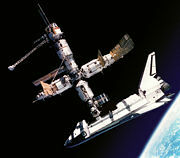 Lack of funding, complicated by the dissolution of the USSR, prevented any further flights of Buran. The Space Shuttle has since been modified to allow for autonomous re-entry via the addition of a control cable running from the control cabin to the mid-deck which would allow for the automated deployment of the landing gear in the event an un-crewed re-entry was required following abandonment due to damage at the ISS. Scaled Composites' SpaceShipOne was a reusable suborbital spaceplane that carried pilots Mike Melvill and Brian Binnie on consecutive flights in 2004 to win the Ansari X Prize. The Spaceship Company will build its successor SpaceShipTwo. A fleet of SpaceShipTwos operated by Virgin Galactic should begin reusable private spaceflight carrying paying passengers in 2009. The Apollo 15 Command/Service Module as viewed from the Lunar Module on August 2, 1971. A Russian Soyuz bringing a crew to the International Space Station. Voyager 1 at 9.5824234 billion miles. Pioneer 10 at 8.3445237 billion miles. Voyager 2 at 7.4351695 billion miles. The proposed Crew Exploration Vehicle approaching the Moon. ↑ European Space Agency, "News," The Rosetta ground segment. ESA.int. Retrieved December 17, 2008. Fortescue, Peter, John Stark, and Graham Swinerd. 2003. Spacecraft Systems Engineering, 3rd Edition. New York, NY: J. Wiley. ISBN 0471619515. Wertz, James, and Wiley J. Larson. 1999. Space Mission Analysis and Design, 3rd ed. Torrance, CA: Microcosm. ISBN 9781881883104. Basics of Spaceflight tutorial from JPL/Caltech. This page was last modified on 14 October 2015, at 16:18.